The water-based material could be used to make artificial skin, longer-lasting contact lenses. If we put a cube of Jell-O on the counter of the kitchen, ultimately the water inside it will start evaporating. It leaves a dry, hardened mass known as jelly. The similar is for hydrogels too. The hydrogel is a gel in which the liquid component is water. It consists of a large amount of water and is stretchy and absorbent until they inevitably dry out. 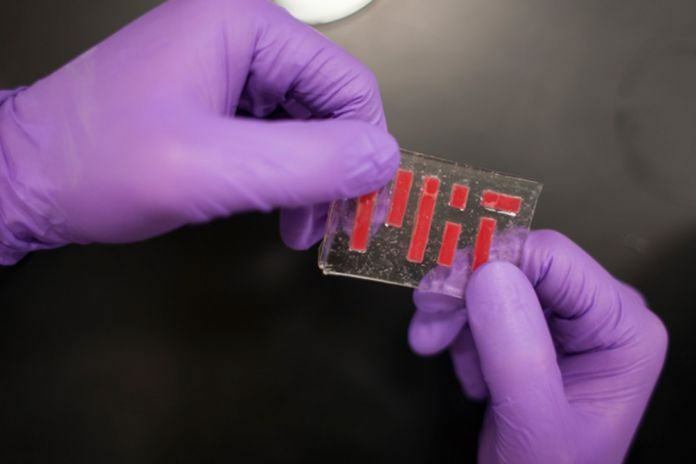 Recently, engineers at MIT have cultivated a new way to protect hydrogels from dehydrating. This new technique can be used in longer-lasting contact lenses, flexible bioelectronics, and even in artificial skin. The team of researchers formulates a method for powerfully tighten hydrogels to elastomers. Elastomers are elastic polymers such as rubber and silicone that are stretchy like hydrogels yet impervious to water. They found that by coating hydrogels with a thin elastomer layer gives a water-trapping obstruction that kept the hydrogel wettish, flexible, and strong. This research is lead under the guidance of Xuanhe Zhao, the Robert N. Noyce Career Development Associate Professor in MIT’s Department of Mechanical Engineering. The team’s hydrogel-elastomer hybrid is similar to, and also stronger than, the bond between the epidermis and dermis. The team has developed a physical model to determine the design of different hydrogel-elastomer bonds. Additionally, the team finding various applications for this hybrid material, including artificial skin. The results are published today in the journal Nature Communications. In the same paper, they also have reported inventing a technique to draw tiny channels into the hybrid material, similar to blood vessels. They have fixed complex ionic circuits in the material to perform nerve networks. In December 2015, Zhao’s team developed a technique to get extremely strong bonding of hydrogels to solid surfaces such as metal, ceramic, and glass. The researchers used the technique to implant electronic sensors within hydrogels to create a smart bandage. They found, although, that the hydrogel would ultimately dry out by losing its flexibility. Zhao said, “This method can make a hydrogel inappropriate with biological tissues, and even harmful. Rather than this, researchers got inspired by skin. Through this, they analyze that coating hydrogels with a material that was similarly stretchy. But it is also water-resistant would be a better strategy for preventing dehydration. They landed on elastomers as the ideal coating. Although this rubbery material had a major challenge: It was inherently resistant to bonding with hydrogels. By using the technique developed for solid surfaces, the team tried to tighten the materials together. But with elastomers, the hydrogel bonding was extremely weak. After searching for a summary on chemical bonding agents, the researchers found a candidate compound that might bring hydrogels and elastomers together. The compound is known as benzophenone, which activated via ultraviolet (UV) light. After submerging a thin elastomer sheet into a benzophenone solution, the researchers covered the submerged elastomer around a hydrogel sheet and reveals the hybrid to UV light. After 48 hours in a dry laboratory environment, the weight of the hybrid material did not change. Thus it indicates that the hydrogel kept most of its moisture. They also calculate the force needed for covering two materials separately and found that 1,000 joules per square meters are required to separate them. This much higher than the force needed to cover the skin’s epidermis from the dermis. 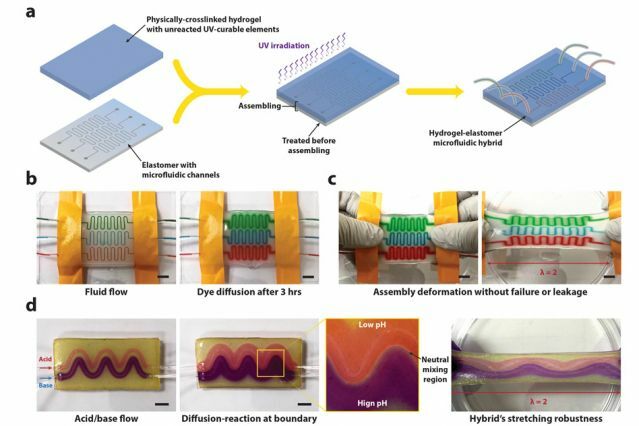 By comparing with skin, the team develops a technique to draw tiny channels within the hydrogel elastomer hybrid for pretending simple network of blood vessels. First, they heal a common elastomer onto a silicon wafer patterning with a simple three-channel pattern, etching the pattern onto the elastomer using soft lithography. After that, they immersed the patterned elastomer in benzophenone. It then produces a sheet of hydrogel over the elastomer and revealed all layers to ultraviolet light. During the test, the researchers were able to flow red, blue, and green food coloring through each channel in the hybrid material. This hybrid-elastomer material can be use as a rubbery microfluidic bandage for delivering drugs directly through the skin. Scientists also investigate the hybrid material’s potential as a complex ionic circuit. This neural network is a circuit that irritates in the skin to send ions back and forth to signal sensations such as heat and pain. Generally, hydrogels consist of water and are natural conductor through which ions can flow. The addition of an elastomer layer, acts as an insulator, preventing ions from escaping. This is an important combination for any circuit. To make it conductive to ions, the researchers dip this hybrid material in a condensed sodium chloride solution. After that, it connected to the material to an LED light. The scientists were then able to produce an ionic current that switched on the light by placing electrodes at the end of the material. The hydrogels and elastomers have different physical and chemical properties. When combined, it may cause new applications. The team is thinking to test this hybrid material’s potential in various applications. The applications might be are wearable electronics and on-demand drug-delivering bandages, as well as non-drying, circuit-embedded contact lenses.